September flew by me! Wow! That went fast. My blog is off to a great start, and I think I'll keep at it. Hooray! It certainly motivates me to finish things. Thank you to everybody for all the wonderful comments made on my blog. 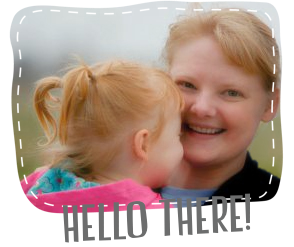 Really, blogging has brought great joy to my life, and I'm so happy to have survived my first month at it. Hi! 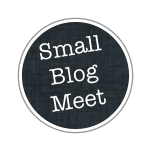 My name is Michelle and I am two below you over on the Small Blog Meetup at Lily's Quilts. I look forward to following your blog and hope you have a chance to check my blog out. So many pretty things made of so much pretty fabric! 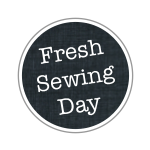 I am visiting via Fresh Sewing Day. That is great to hear you love blogging - I have been at it for 8 years and love it so much! 8 years?! That's fantastic! I hope to say that someday too. Thank you for visiting. I love the blue and white star quilt! Thank you so much. I hope you have a great day! Your blog is off to a great start! I love the look of it. I came over from Lilys Quilts. The world of blogosphere has been a huge difference since beginning a couple of years ago! Wow! Love your blue and white star quilt! Looking good, and it does help, somehow, this blogging lark, makes you focus, perhaps? Congrats on getting started! I'm sure there will be more great things coming from you!